Now in e-book downloadable form. Adobe Acrobat Reader required to view this file. You will learn the easy procedure for effective toilet training which doesn’t make you pull your hair out. You get up-to-date knowledge on the essential steps of toilet training which include timing, readiness and personality differences. 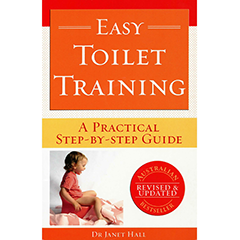 Easy Toilet Training gives step by step procedures for effective toilet training with maximum ease and fun for all! After reading this book you will know how to get results quickly, with the least effort and without hiccups.